I can't quite put into words how amazing it is to photograph my clients, more than once! It's a joyful feeling when you meet people that come back to you for their annual portraits, or when I photographed their wedding and they come back for their maternity and newborn pictures, for their kids' graduations, family reunions, and of course, their baby's first birthday! There is something very special about photographing familiar faces, in different stages of their lives! Baby Isaiah is celebrating his first trip around the sun! 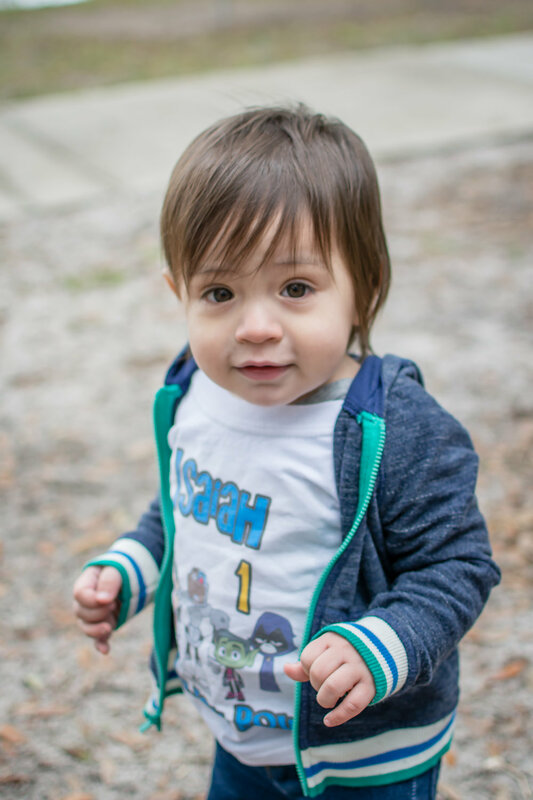 His parents wanted nothing more than a family celebration and baby Isaiah's very own photographer to capture photos of him throughout the day, and finalized it with a super cute cake smash with the cutest, personal sized, Teen Titans birthday cake. The day turned out quite surprising, being that it was cold and breezy (out of nowhere! ), but even with the craziness of the Florida weather, the day was beyond beautiful and I was able to capture SO MANY great pictures for this family. Both the birthday celebration, and cake smash, took place in Trotwood Park, Winter Springs. For this kind of event, I usually work on a per-hour basis and the most popular birthday package is the 2 hour coverage, like this one. I'm sharing more images than usual to give you an idea of the variety of images I can capture as your baby's personal photographer on their birthday. I first met this family when I had the opportunity to photograph Desire's Maternity Session in St. Augustine. The beauty behind maternity photography is that it's the beginning of a friendly relationship between client + photographer. It's the beginning of great captures and great memories, and I've been very blessed to have some of these along the way. It's like becoming an extended family member with the blessing of seeing the babies grow, which brings me a whole lot of joy. I love maternity sessions and I hope this year I get to capture many more! If you're interested in having a maternity session for yourself, or if you'd like to gift a session to someone you know, please contact me for more info!